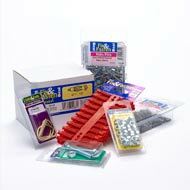 The Fix & Fasten range offers a huge variety of fixing and fastening products for almost any requirement. Packed in eye-catching, space-saving, colour-coded and barcoded blister packs to make best use of your display space and maximise your profits. Shown below is every product in the Fix & Fasten range ordered numerically by code number.